on any tank, anywhere no matter how remote. ​A built in modem sends this information to ​our secure data centre via the cellular or sigfox network. 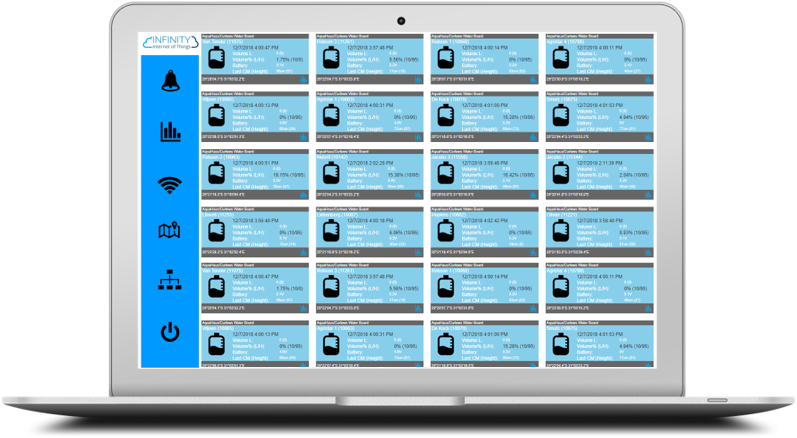 This data then flows into your personal online dashboard, which shows your business's ​tank levels and usage in a simple format. ​You will receive regular updates about your tank levels and usage across your business. It can be stressful not knowing if your stock have enough water, especially during times of high temperature and between water runs. It is also critical that you have enough water in your tanks when running pressurized irrigation. Remote tank level monitoring system helps take the stress out of stock water storage and supply. Liquid fertilizers are delivered directly into farm storage tanks. As a farm manager, you need to ensure you have enough supply available when you need it. As a supplier, you want to make sure your customers never run low. Remote tank level monitoring ensures customers always have a reliable supply available when they need it. Having sufficient fuel on the farm ensures your farm machinery and irrigation pumps are available when required. As a fuel supplier, you want to proactively fill your customers' fuel tanks and provide the best customer support. Fuels are an expensive resource and an investment in remote fuel tank monitoring will pay for itself very quickly. levels also ensure tanks are refilled before it is too late. Remote monitoring provides peace of mind that your machinery lubricants are well stocked. Waste oil and water from industrial processes need to be stored locally and then removed and recycled. Remote monitoring helps you keep track of all your liquid wastes, optimize collection schedules and provide improved customer service.